I’m not sure why I haven’t tried remaking these without the sugar, butter, and gluten before. I’ve always loved them growing up. Last year I got several reader requests for them, but never made it to actually making them (my holiday to-make list was just waaay too long…). But this year I’ve been seeing them everywhere and felt like the time has come. I decided to go for a slightly different version however. Instead of butter I used almond butter, instead of wheat — sorghum (or rice flour — both are nice), and instead of sugar — maple (I also tried it with agave — worked great; coconut sugar — not a fan, the flavor is too pronounced). No oil, no gums or funny flours. No chilling, waiting, cutting… Worked a treat. 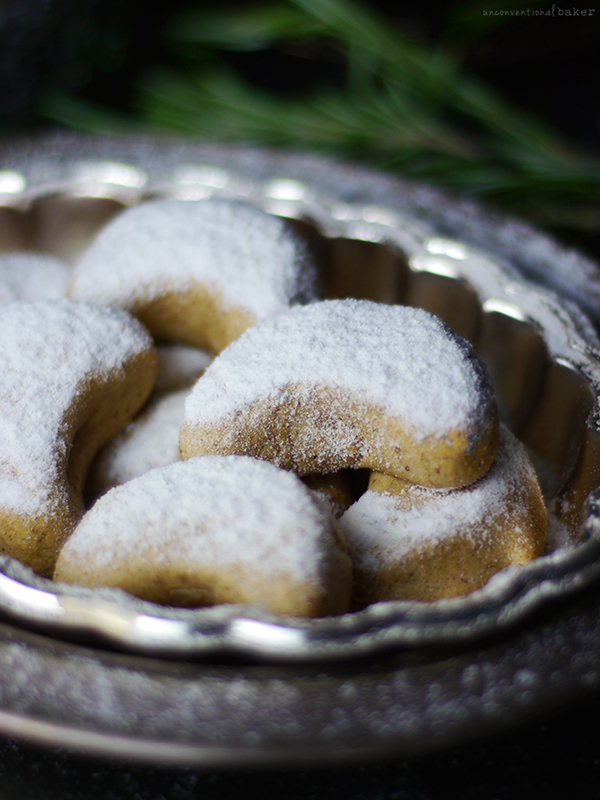 Not quite as sweet as the traditional powdered sugar-packed version, but a nice wholesome substitute that was a real winner at the holiday table. These come together very easily — process the batter in a food processor, shape into moons and bake! The dough should be smooth and pliable and easily rolled into little balls in your hand. If it’s too sticky for that, add a touch more flour, if it’s too dry / crumbly add a tiny touch more almond butter (or a small splash of water — a tip that one of my readers shared worked well for them) and re-process. 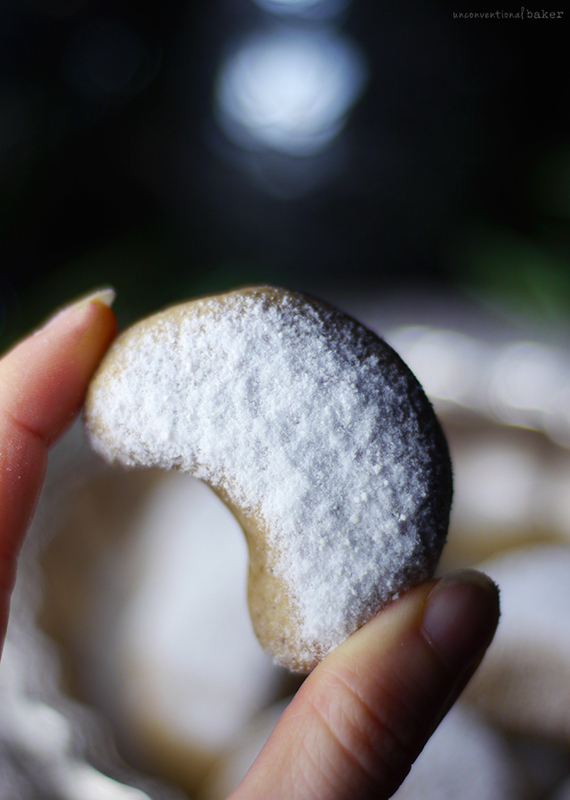 If you like your cookies softer, they can be ready in as little as 15 mins, but moon cookies are traditionally more dry and crumbly, so I baked mine for about 25 mins (just keep an eye out so they don’t burn), or anywhere in between that. 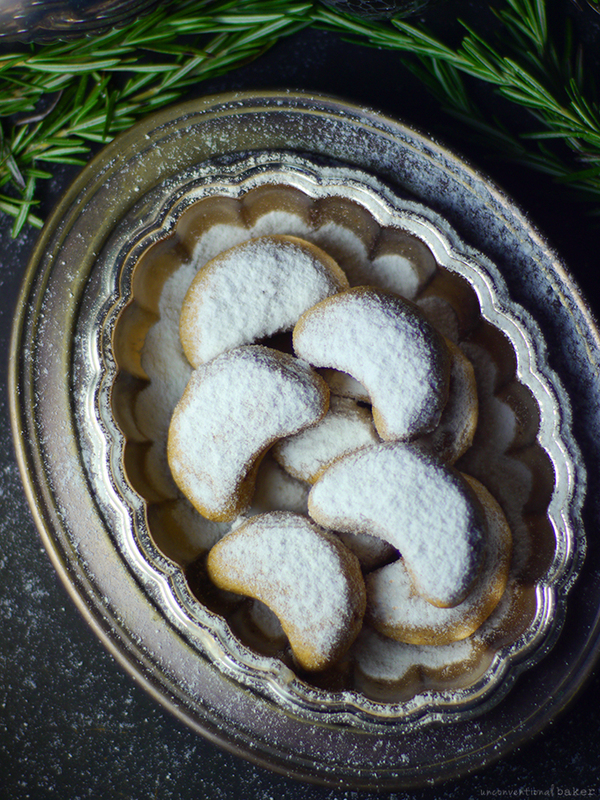 A gluten and dairy free recipe for traditional holiday almond crescent cookies. Super simple and comes together in minutes. Process all cookie ingredients in a food processor into a uniform sticky mixture. If the mixture is too dry, add a bit more almond butter and process again until the mixture begins to stick together and start turning into a ball in the processor (you want it to be soft and pliable, but firm enough that you can roll it into a ball). 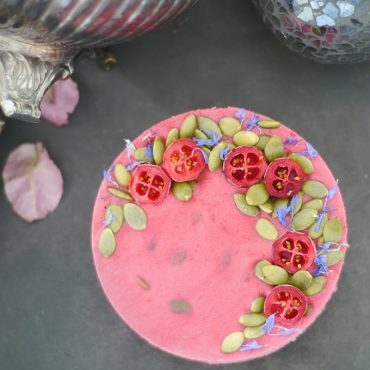 Grab about 1 tablespoon’s-worth with your hands and roll into a ball, then a little log, then shape into a crescent with your hands. Place on the cookie sheet and repeat with remaining mixture, spacing the cookies about ½” apart. Bake in a pre-heated oven for 25 mins (or only 15 for soft cookies). Cool completely on a wire rack, dust with coconut milk powder and enjoy! This post contains an affiliate link to my favorite powdered sugar substitute — dairy-free powdered coconut milk. 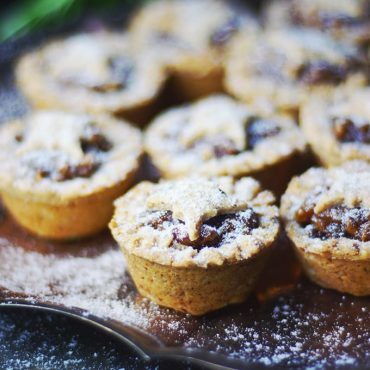 Wanna make this recipe for Christmas-if i dont have Almond flour what would be the better Substitute: sunflower seedflour or ground almonds? And is there anything i could use instead of sorghum? Yes! I’ve been craving a dry(ish), crispy, crumbly cookie and this just may fit the bill! I don’t have dried coconut milk—do you think cocoa sprinkled on top would work—or cacao nibs—or would that compete to much with the almond? Or anything else to decorate the top that wouldn’t be sugar (although I do have confectioner’s sugar just sitting there from when I used it more) or dried coconut milk (which is a brilliant idea)? Hi Ellen, I think cocoa could work. I don’t think the cacao nibs will stick though. I prefer the dried coconut milk because it looks very similar to confectioner’s sugar and also because it has a very nice mild flavor. Cocoa would add its own flavor to the mix, but cocoa and almonds go well together so I don’t see why not give it a go. A tip for those at high altitude, add a teaspoon or two of water when processing the dough to keep it from crumbling. Baking times don’t need adjusting (I’m over 7,000 ft). These are so lovely and the almond is not overpowering (not that anything is wrong with that imho) and remind me of a tasty biscotti, but softer. Thanks for sharing, Janel! :) The water trick is good to know. How is this my first time seeing this recipe??! I love it! So simple with ingredients that I always have around. You’re a cookie goddess! make these as soon as I get home this week. Much love from Calgary Alberta for your amazing website and efforts. Thanks so much, Sonja! Happy to be of service ?. Enjoy the cookies and happy rest of the holiday season to you! 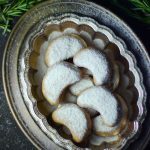 I have been looking for a vegan version of my all-time favourite biscuit! Thank you so much! :) The only problem is that I can’t seem to find sorghum flour. Is it like millet? Or is it something special that can’t be substituted with anything else? Thanks for your answer! As I couldn’t find white rice flour either, I used very fine brown rice flour and they are incredibly tasty :) Thank you so much for that recipe, I used to love Vanillekipferl, as they are called in Germany, and thought I couldn’t have them anymore without the butter and sugar. Aw, so glad you liked them, Julie! :) And that they worked out with the brown rice flour too. Enjoy them! Is there any way you could put weights on your recipes please? I seem to have trouble with cups and flour. 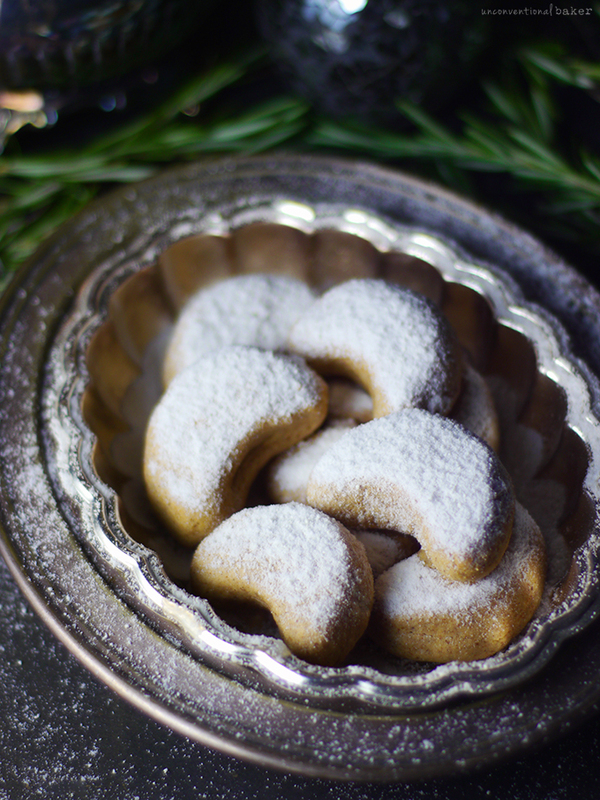 I bought your book and have made some of the cheesecakes and they are divine but these cookies were not for me – the dough was really dry and the cookies too dense and kinda gritty from the almond flour. Ah well you can’t win them all. It was worth buying your book for the caramel swirl cheesecake alone! Keep on doing your thing! Sorry the cookies didn’t work out for you though. I did mention in the notes above that the baking time of 25 mins will make dry and crumbly cookies. They can be softer on the inside if you only bake for 15 mins instead. I like them both ways, but sounds like a shorter baking time would be more right for you. But also I’m not sure whether you mean the dough was too crumbly when you were trying to shape them into cookies? Not sure if you modified anything in the ingredients? If not, then it sounds like the dough just needed more almond butter to soften it. Also using almond flour as opposed to meal helps to get a finer and more uniform texture. And about weights — I’m really sorry, but I just don’t think I’ll be able to do that any time soon. It’s hard to explain, but it’s just counter-intuitive to how I work in the kitchen so whenever I’ve tried to add that as an extra it just dragged out the process quite a bit for me and while I know if would help some, I just don’t have the extra time at the moment. I know weights are essential for some forms of baking, but the thing is that most of my recipes don’t require super precision — which is why cups happen to be waaay easier for me to work with. It’s more about getting comfortable adjusting things. So for example, in this recipe, as I mentioned in the write-up, if the dough seems too dry or crumbly, then you’d need to add a bit more almond butter for moisture, and so on. They are so simple, I’m amazed! I was expecting many more ingredients with all the traditional stuff that had to be replaced. You always amaze me with what you can do with the simplest of ingredients. 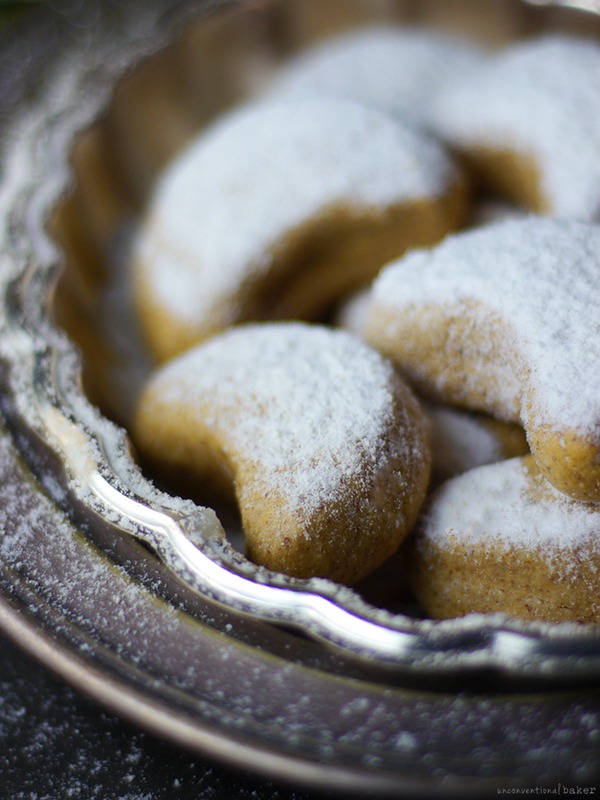 They look so delicate and dainty, and I love the flavor of almond extract. Mmmm i can just imagine biting through the powdery top into soft sweet cookie <3 There really is something about powdered "sugar" that is mesmerizing…maybe its because its the visual representation of my favorite flavor: sweet! Thanks Natalie! Funny, I started off thinking… Earth Balance… maybe powdered coconut milk in place of powdered sugar… a gf mix… ??? Just the thought of all that made me not want to make or eat them at all. So I went for a simplified version — sure it’s not the exact traditional, but still sooo delicious and pretty close — I’ll take the reinvented version any day (and I have been :D Just finished another batch yesterday). The almond butter works lovely and sounds delish! I’d totally keep them softer! The perfect fancy little bite with some coffee! I love it!